Highlights: Nintendo Direct Announces A Few Release Dates And Games | Nerd Much? Tonight’s Nintendo Direct wasn’t exactly the most thrilling, but there were some very important highlights to take away from the presentation. Between all of the somewhat lacklustre games was ARMS, Minecraft, Sonic, Splatoon 2, and a very brief mention of new tech for the Switch. Well, they showcased a few of the arm weapons that we’ve seen already, including: Toaster, Sparky, Popper, Tribolt, Slapamander, Chakram, Bommerang, Homie, Revolver, Megaton, and Chilla. As well as new character by the name of Min Min, who has ramen for arms. Each of these arm weapons are for specific characters, and can be upgraded with fire, ice, or electricity with the in-game currency earned through playing and gaining experience. 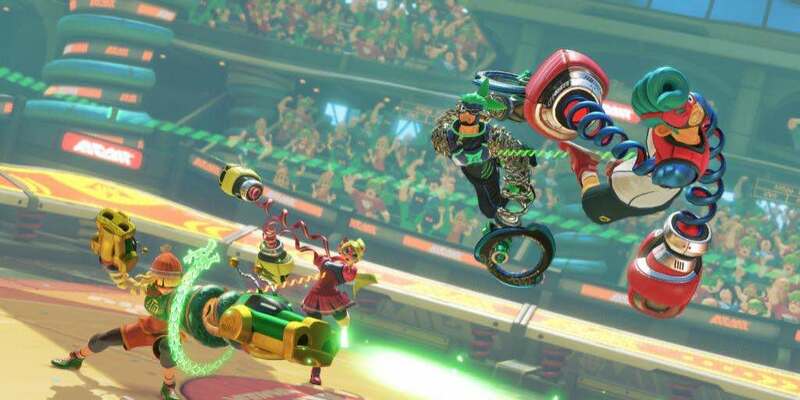 ARMS will be launching June 16th along with the aforementioned new tech themed after the game. Bright yellow, to match the yellow of the ARMS banner, will be another color of Joy-Con you can order. Which implies that we might get Mario themed ones too. In compliment to this, and the apparently very long game sessions Nintendo expects you to have, the company has announced a Joy-Con AA Battery Pack. As most gamers would have guessed by now, Minecraft has officially come to the Switch. It comes with the Super Mario Mash-Up pack, and multiplayer, which is fairly standard by now for the game. Minecraft will launch at the Nintendo eShop on May 11 of this year, and a physical copy release date will be sometimes afterwards. Some new footage, about two seconds worth, was shown of Sonic Forces, and still no release date other than this holiday season. Those two seconds did show what appears to be two modes, however, one of the 3D gameplay, and the other of classic sonic in 2D. This becomes all the more confusing when Nintendo immediately announces Sonic Mania as well. Sonic Mania is a 2D reboot of the original games, with brand new stages in addition to the old ones. The latter is to launch sometime in the summer, which I will definitely look forward to. Not only do we have the launch date of July 21st (another summer date), but a brand new four player co-op mode called Salmon Run. In this mode, you and three other friends battle odd fish-like creatures called Chum, in an attempt to collect Golden Eggs. You’ll also be able to save your fellow fallen friends via the lifesaver feature, simply by making your way to them and resuscitating them. Look like we have a lot to look forward to this year with the Switch. Personally, I’m up for Sonic. It’s been years since I’ve played anything resembling the original on the Game Gear and it’s been sorely missed. I am more than happy to have a reboot, even if it doesn’t bring anything new to the genre.